Can you identify the woman in this image? Black and white medium format negative showing George Henry Elms seated on a couch with a woman, presumably his wife. George Henry Elms was born in Hamilton, ON on 25 January 1914 and moved to Whitby in 1921. He graduated from the School of Practical Science at U of T in 1939. In 1937, he began training to become a pilot and joined the Royal Canadian Air Force when the Second World War started in 1939. He went overseas as a flying officer and became a Squadron Leader in 1941. Two years later, he became a Wing Commander in chage of a Mosquito group which did night bombing in Germany. In 1946, Elms was promoted to direct of the Royal Air Force staff College at Bracknell, England. Following the Second World War, he was posted to the Middle East and South-East Asia, finally settling in Spain. Elms died at Mejas, Pueblo, Spain on 13 January 2007. 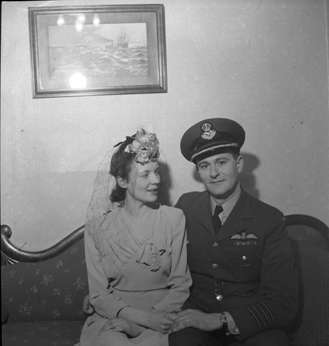 George Henry Elms with Wife, c.1945, Marjorie Ruddy. Whitby Archives A2013_040_1158.